Do you have a minute to spare to learn some English? 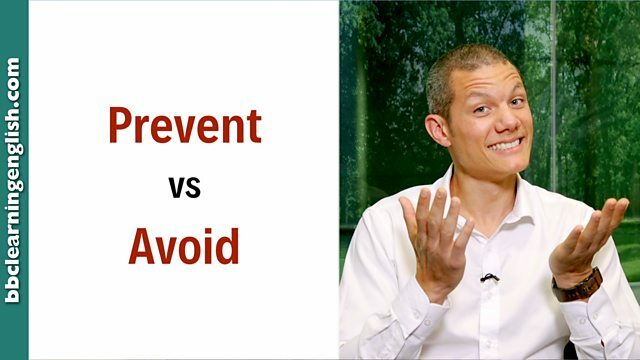 Dan discusses the difference between prevent and avoid! Give us 60 seconds and we'll give you the English! Hi guys! Dan for BBC Learning English here. This time we're looking difference between prevent and avoid. Prevent basically means stop. If you prevent something, you stop it from happening - often before it starts. You can prevent something, prevent something from happening or prevent someone from doing something. For example: The arrival of the police prevented crime. Or: Losing my passport prevented me from flying. Or: I prevented her from slapping me! Wow! Now avoid, basically means miss. If you avoid something, you try to make it miss you. For example: I avoided meeting my ex. Or: I avoided the slap easily! Prevent means stop. Preventing something means stopping it, often before it has happened. You can prevent something, prevent something happening, or prevent someone from doing something. The arrival of the police prevented crime. His hand prevented the cup falling. Losing my passport prevented me from flying. Avoid means miss. If you avoid something you miss it, or try to make it miss you. You can avoid something or avoid something happening. I avoided the slap easily. I avoided being discovered by hiding. If you aren't sure, have a look at the lesson again. Choose the correct statement below. Look for clues in the sentence. Did we stop the door or miss it? Complete this sentence with the correct verb: I ________ the door from hitting me by stopping it with my hand.